Seven of us met at the trailhead and hiked into the Sky Lakes Wilderness area, visiting 6 lakes on the way around the loop trail. 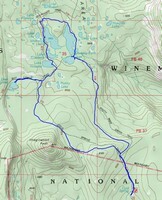 It was the first official Wednesday hike since we completed the Mt. McLoughlin climb on July 18th, which means we lost 5 other hiking opportunities in the interim due to smoke. Temperatures were in the high 60’s with a slight breeze as we left the cars behind and began our hike. We hiked this section in November last year after an intense fire had burned a wide swath through the area. We were hoping to see more new vegetation growing in the burn areas, but there was very little improvement - maybe next year. The lakes on the other hand looked fine and were located in non-burn areas, so 60% of the hike was in a normal forested landscape. One of the interesting issues (thinking of air quality) was the trail dust was 5 inches deep in some places in the burn areas. At times we all spaced apart enough to allow the dust to settle between hikers. Smoke did not seem to be an issue until we were near the cars on the way out. Most of us met at Lake of the Woods Lodge for refreshments. We sat outside on the deck overlooking the lake and the weather was perfect for ending a very successful hike.